The westerlies-dominated area of arid Central Asia is the furthest dust source from the oceans and plays an important role in global change. Central Asia is also one of the most significant loess landscapes on earth, located between the well-studied European loess sequences to the west and the extensive Chinese Loess Plateau to the east. This enables researchers to carry out interregional paleoclimatic investigations along a west-east transect across the entire Eurasian loess belt of the Northern Hemisphere. 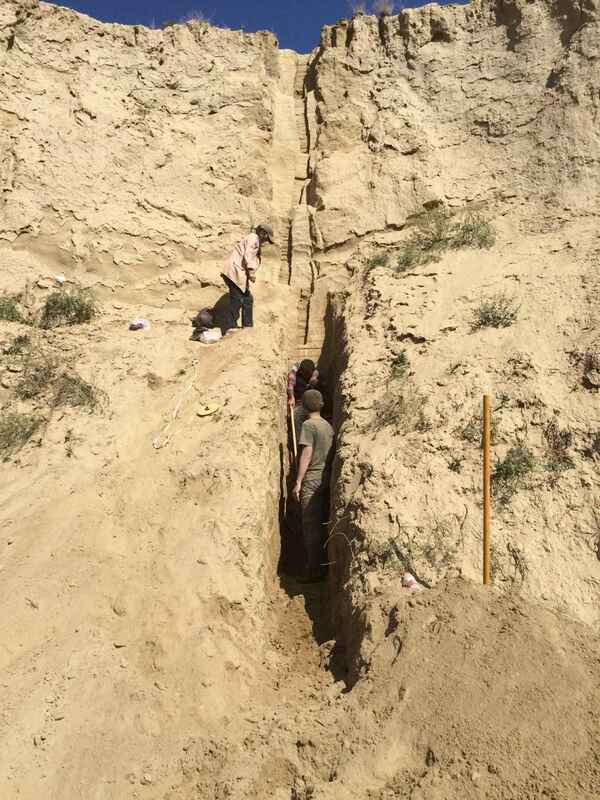 However, Central Asian loess is still far from intensively investigated, there are few reports of climatic change during the last glacial period in Central Asia, dust formation and climatic forcing mechanisms are yet not systematically understood. Recently, a new paper about Central Asian loess has been published in Climate of the Past (Li et al, 2018). This study investigated magnetism and sedimentology proxies of loess sections in the Ili Basin, eastern Central Asia, and elucidated environmental dynamics for dust accumulation and paleoclimate change. This study found that magnetic susceptibility (MS) was more strongly influenced by allogenetic magnetic minerals than pedogenesis and might therefore be used to indicate wind strength. To further explore the temporal variability in dust transport patterns, the authors separated loess grain size distributions based on the hierarchical Bayesian model for end-member modeling analysis. Three grain size end-members (EM1, mode size 47.5 μm; EM2, 33.6 μm; EM3, 18.9 μm) were generated. These EMs represent distinct aerodynamic environments. EM1 and EM2 are inferred to represent grain size fractions transported from proximal sources in short-term, near-surface suspension during dust outbreaks. EM3 appears to represent a continuous background dust fraction under non-dust storm conditions. The authors selected EM1 as the most sensitive proxy of wind strength. Comparisons of the EM1 proportions with mean grain size from the Jingyuan loess section in the Chinese Loess Plateau (Fig.1), considering modern and Holocene climate data, the authors argued that the Siberian High (SH) pressure system was the dominant influence on wind dynamics. This study is of significance for understanding the climatic implications of loess proxies, source tracing of Central Asian dust. Furthermore, six millennial-scale cooling (Heinrich) events were identified from the loess grain size records. 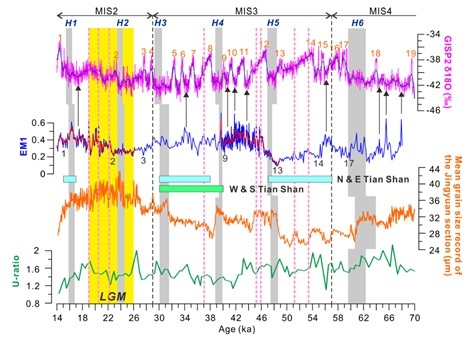 These data supported the transmitting mechanisms hypothesis that the SH acted as teleconnection between the climatic systems of the North Atlantic and East Asia. It provides new evidences for the climatic teleconnection between high latitudes in the northern Hemisphere and Chinese Loess Plateau. Song, Y.G., Luo, D., Du, J.H., Kang, S.G., Cheng, P., Fu, C.F., Guo, X.H., 2018a. Radiometric dating of late Quaternary loess in the northern piedmont of South Tianshan Mountains: Implications for reliable dating. Geological Journal online, 1-10. https://doi.org/10.1002/gj.3129. Zeng, M.X., Song, Y.G., Li, Y., Fu, C.F., Qiang, X.K., Chang, H., Zhu, L.D., Zhang, Z.P., Cheng, L.Q., 2018. The relationship between environmental factors and magnetic susceptibility in the Ili loess, Tianshan Mountains, Central Asia. Geological Journal online, 1-13. https://doi.org/10.1002/gj.3182.